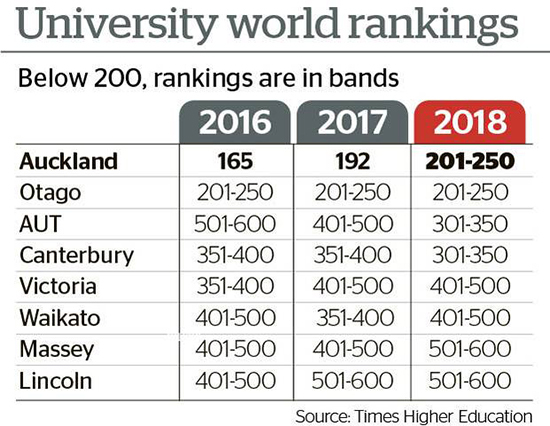 AUCKLAND (AUT University News/Pacific Media Watch): The Times Higher Education (THE) World University Rankings has released its 2019 results, placing AUT for the first time in the top three in New Zealand, and the top 350 in the world, reports an Auckland University of Technology statement. Over the last four years AUT has climbed consistently in The Times Higher Education ranking and ascended two bands from its 2018 position in the 401-450 band. Ahead of AUT are the well-established universities of Auckland and Otago, both in the top 250. A major factor in AUT's ranked position this time was its score for citation impact which was highest in New Zealand and close to the top 100 in the world. The citation score reflects a university’s role in the spread of new knowledge and is based on the average number of times the university’s published work is cited by other authors globally. AUT also retained the top position in the country for international outlook which is scored as a composite of the proportions of international academic staff, international students, and internationally co-authored research outputs. The Times Higher Education ranking is a rigorous system that assesses more than 1250 research intensive universities – selected from the estimated 26,000 universities in the world. Their ranking assessment includes, in addition to the above categories, scores for teaching and research. A large component of the teaching score is derived from the proportions of doctoral students and graduates. Even with AUT's 1000 or so doctoral students (and growing), it has the lowest ratio of doctoral to total EFTS in the New Zealand universities. The Times Higher Education stated in its press release: “It’s highly encouraging to see such a strong performance from the AUT this year – at less than 20 years old, it’s been a swift rise, and to become a global top 350 university is hugely impressive."